Via this window, you can change a name of the selected node, toggle the node on and off, modify the node's transformation parameters, its visual representation, set up physics, and assign properties. Node tab contains general and node-specific parameters. For example, settings for object-related nodes include surface settings, such as rendering, LOD, intersection, collision, material, and property. The node parameters on each tab are grouped in separate panels, and each panel is expanded by default. You can collapse panels by clicking the arrow to the left of the panel name. UnigineEditor allows multi-selection editing of nodes: you can adjust parameters of several selected nodes at once by selecting nodes in one of the available ways and tweaking the required parameters. 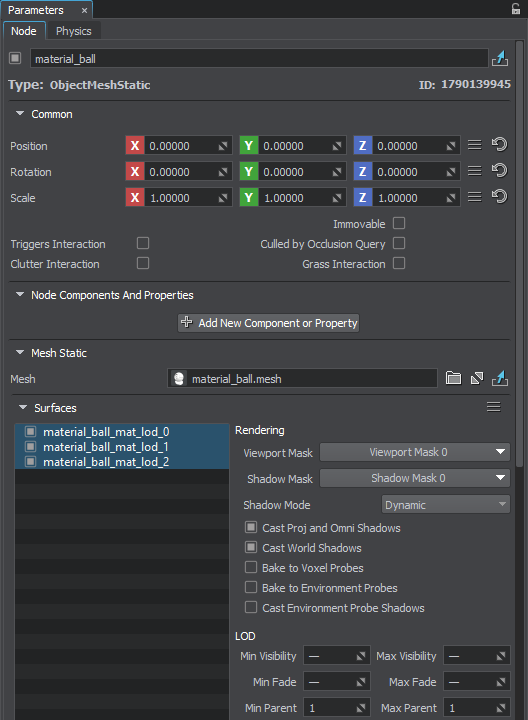 For example, you can scale nodes, disable casting of world shadows, or assign the same material or property to them. Only parameters that are common for all selected nodes are visible in the Parameters window: if selected nodes are of the same type, the Node and Physics settings are available for editing; for the nodes of different types, only shared parameters on the Node tab are available. Per-surface settings (such as material, rendering, or LOD settings) are available only if all selected nodes are of object-related types. If selected nodes have several different surfaces, per-surface settings will be applied to the entire node as if it has only one surface.